This Bespin Freeze Chamber was made mostly from foamboard and bamboo sticks. The size of my Freeze Chamber is approx 12" deep (since all my customs sit on 1 x 12 shelving) and 30" wide. I cut the foam board in the shapes I would need and glued them in place. Next I took bamboo sticks (from chop sticks) and made the railing. The back railing and octagon shapped rail were made from a close hanger. The stairs were made out of foam board with poster board glued over the tops of the steps. Once all the pieces were hot glued, I spray painted everything with flat black paint. I know the picture makes it look like glossy black, but that is just the flash from my camera (I use a 35mm with zoom lense, no digital yet). After the paint dried, I applied the stickers I made from the graphics at niubniub's universe. I then cut some foam board to make the back ground. Next I spray painted it sky blue. Once dry I hot glued the background piece in place. You will notice at the top of the picture the "CLAW" is hanging down. I cut a piece of foamboard and glued it across the Chamber to each side of the background. The "claw" is glued to the center of this piece over the Freeze Chamber. 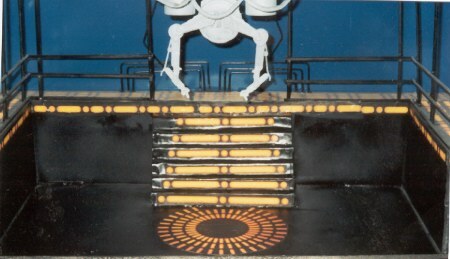 The claw was made from from the "coin diorama" from the Millennium Coin figures, with the legs from an AT-ST model for the actual "clamps" glued to it. On both sides of the claw I glued empty film canisters. I also used pieces of round shoe strings for the hoses. Once I got the Freeze Chamber playset from the Star Wars Fan Club, I took my custom playset off the shelf. Someday I will make a different custom Bepsin Freeze Chamber using the one from the Fan Club.